THE DEVELOPER - COUNTRY GARDEN PACIFICVIEW SDN BHD ("CGPV"), is the developer and operator of Forest City Project, which Joint Venture between Country Garden Group ("CG") & Esplanade Danga 88 Sdn Bhd ("EDSB"). CGPV is 66 percent owned by the China-based giant through Malaysian registered subsidiaries Country Garden Waterfront Sdn Bhd, Country Garden Danga Bay Sdn Bhd and Country Garden Real Estate Sdn Bhd. The state government's share of the project, or more specifically KPRJ, is purportedly through Esplanade Danga 88 Sdn Bhd, which holds a 34 percent stake in CGPV. Country Garden, a "China's Well-Known Trademark" enterprise, was founded in Year 1992, it is one of the world largest integrated real estate development enterprise. It was listed on the Hong Kong Stock Exchange in Year 2007 April , which is a company that comply with domestic law and regulation and obeys overseas listing organization's regulatory and legal restriction. It is one of China's leading integrated property developers,its standardised development model has a broad coverage over every aspect of property development such as construction, installation, fitting, property development, property management; as well as high-star rated hotels, schools, commercial and retail area and leisure and entertainment, etc. Country Garden persisting on it's core vision -"We hope the society will become better with our existence" and "With a constant ideal to be a conscientious, responsible, sunshine company" and integrated it's enterprise to a more comprehensive group including five-star hotel, education, commercial, and entertainment. 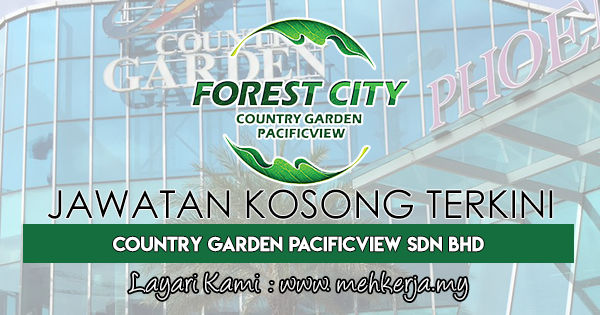 0 Response to "Jawatan Kosong Terkini di Country Garden Pacificview Sdn Bhd - 13 Mac 2019"